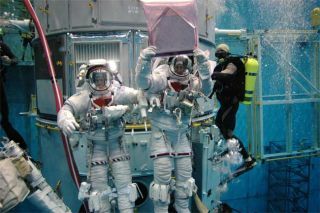 Astronauts Mike Massimino (right) and Mike Good, STS-125 mission specialists, with home plate from New York City's Shea Stadium during a break from their training in the JSC Neutral Buoyancy Lab. Massimino brought the plate aboard the Space Shuttle Atlantis for the trip to Hubble. NEW YORK - The longtime home of the New York Mets baseballteam, Shea Stadium, may be history, but a crucial part has been immortalized bya trip to space. NASA astronaut Mike Massimino, a New Yorker and fervent Metsfan, took Shea Stadium's home plate with him on a recenttrip to the Hubble Space Telescope, where he and six crewmates aboard thespace shuttle Atlantis successfully overhauledthe aging observatory. "We're allowed to takeup items that are from organizations that are important to us,"Massimino told SPACE.com. "The Mets are great. They're tearing downtheir old stadium. What better way to represent a stadium or a ball field thanhome plate?" Massimino, 46, is set to present the plate, returned fromits 5.2 million-mile trip to space, Friday evening at a Mets game where he willthrow the first pitch. "I'm a big baseball fan, I'm from New York, and theMets were my favorite team growing up," Massimino said. Queen's Shea Stadium was the home of the Mets from 1964until 2008, when the team moved to the adjacent Citi Field. After tonight'spresentation, the Shea home plate is set to be displayed in the new stadium. Massimino is a native of Franklin Square in long Island. Henow lives in Houston with his wife and two children. But though he's traveledfar and wide, including to space, he said New York will always be home. "I've lived lots of different places, but New York ismy home for sure," Massimino said. "I do feel like a New Yorker atheart." Massimino joined NASA?s astronaut corps in 1996. Since then,he has logged almost 24 days in space over two shuttle flights, both to Hubble.During the recent mission, he even usedhis brute strength to yank a stuck handrail off the Hubble Space Telescopeto clear the way to replace a broken instrument. ? On Thursday, Massimino spent time visiting the New York CityFire Museum, where he presented an American flag flown to Hubble in honor of9/11 firefighter victims and families. The astronaut's late father was a NewYork Fire Department fire inspector. "I went to the Fire Department museum yesterday,"Massimino said Friday morning. "That was pretty cool, getting a chance tosee the chief of the Fire Department and give them mementos from the flight." Massimino said taking up items with him on space missions helpto keep him connected to his roots on the ground. "You can't take friends and family with you, but youcan take stuff," he said. "That?s kind of a way to pay tribute to myhometown. Pay tribute and also take something with me that makes me feel like they'rethere with me." Rounding out his weekend visit to the city was a trip to theIntrepid Sea-Air-Space Museum, onboard the World War II aircraft carrier USSIntrepid and other ships docked at Pier 86 on Manhattan's west side. Massiminowas the keynote speaker there at a summer youth leadership conference onThursday. On Friday before the baseball game, the astronaut plans tomake an educational presentation at the New York Public Library, and visit theNew York Hall of Science Rocket Mini Golf Park. Each appearance gives him a chance to connectwith people who are interested in space and talk about his work at Hubble. "People have just watched the mission and everybody'spretty excited," he said. "Everybody benefits from Hubble. We all canappreciate the beauty of the universe that Hubble shows us." Massimino even became the firstperson to "tweet" from space when he sent status updates fromorbit to his followers on Twitter. Massimino opened the Twitter account,@Astro_Mike, before his recent mission as a way to keep the public informed andinterested in NASA's human spaceflight missions. "From orbit: Just saw Orion?snebula in the night sky ? the sights make all the hard work and risk worthwhilefor me," Massimino tweeted May 20 from space.